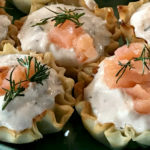 If you are looking for an easy to make, yet delicious and visually stunning appetizer, then this smoked salmon phyllo cups recipe is for you! It seems like every year when we host or are invited to a party we prepare and bring the same appetizer or side dish recipe. Our go-to appetizer recipes include buffalo chicken dip, spinach artichoke dip or veggie stuffed mushrooms. Each of these recipes are easy to prepare and because we have made them so often, they take little mental effort on our part. However, there are sometimes when you just get in a rut and want to make something different. But because it is such a busy time of the year, different can not mean difficult. We wanted to make a new appetizer to take to a holiday party, but we had little time to get creative. So when I was strolling through the grocery store looking for inspiration, smoked salmon caught my eye. I have never eaten smoked salmon before, but I have seen it often used in recipes on cooking shows. 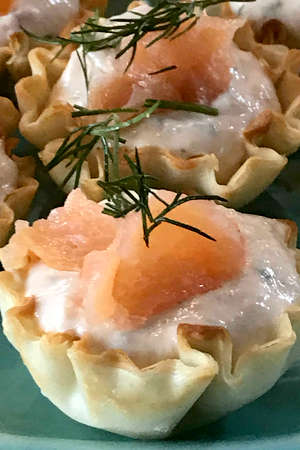 The original inspiration for this smoked salmon phyllo cups recipe. I recall seeing an appetizer recipe that included slices of cucumber topped with dill and chive cream cheese. And then on top was a small folded piece of smoked salmon. I was intrigued. What a simple, yet elegant appetizer that took only minutes to prepare. 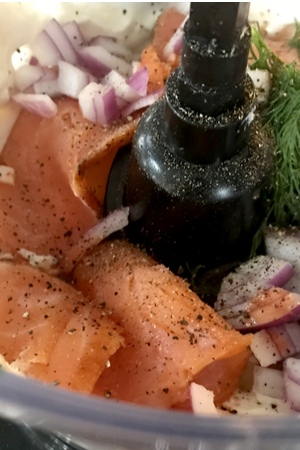 So when I spotted a package of smoked salmon in the meat department of the grocery store, I had the beginning inspiration for a new, easy to prepare appetizer. I had full intentions of replicating the cucumber smoked salmon appetizer. However, I had already passed through the produce section. So I continued the rest of my grocery shopping to see what else I could find. Smoked salmon in the food processor ready to be made into a delicious filling. I picked up a bar of cream cheese knowing that I could make almost any appetizer using it. And right down the aisle from the cream cheese was sheets of phyllo dough. I immediately knew that I could make phyllo cups in my mini muffin pan for bite size appetizers! So I threw them in my cart with excitement and anticipation of new appetizer that I would make. But as I strolled down the freezer aisle, things got even better! Right next to the frozen pie crusts sat a box of frozen, pre-baked phyllo cups! All I had to do was thaw them and fill them with the smoked salmon and cream cheese mixture! 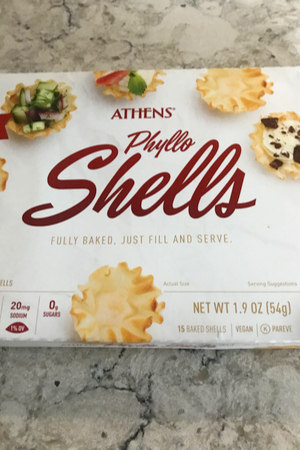 Frozen, baked phyllo cups makes this appetizer even easier! It could’t get any easier than that! Of course, if you have extra time, you can make your own phyllo cups. However, because time was of essence, I was all for using the pre-baked version. I knew that I wanted to make a cream cheese based filling. And of course, smoked salmon would be the star of the show. But I also knew that I needed to add a little additional flavor to the filling. 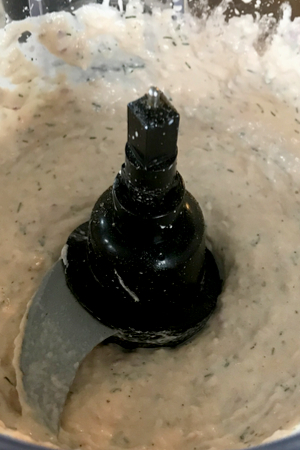 Using a food processor makes preparing the filling a breeze! I looked in my refrigerator to see what I could come up with. Ranch dressing always goes well with cream cheese. But I wanted to add a little fresh flavors as well. I diced up a little red onion and dill and added it to the mixture. And in order to balance out the creaminess, I added a few dashes of hot sauce and cayenne pepper. Be sure to process the mixture until smooth, scraping down the sides as needed. No worries, it didn’t add any heat to the mixture. It simply tones down the cream based mixture. I gave it a quick taste and it had an amazing, well balanced flavor. All that was left to do was fill the phyllo cups with the smoked salmon mixture. The phyllo cups are filled with the smoked salmon filling. Once they were all filled, I decided they needed a little garnish to jazz up the look. Because I had a few extra slices of the smoked salmon I diced them up and put them on top of each cup. 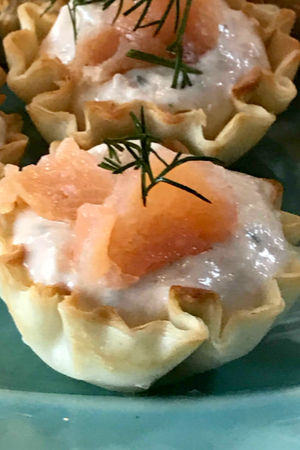 A little dill on top, and I had completed the easy to prepare, stunning, smoked salmon phyllo cups! 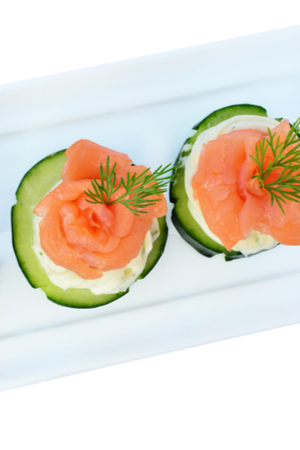 Adding a little garnish of smoked salmon and dill made all the difference in the presentation of this appetizer. So this year, if you are looking to bring your appetizer up a notch without increasing the time or effort in preparation, this recipe is for you! 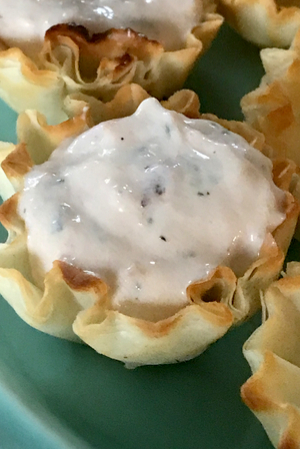 A creamy smoked salmon, dill and ranch mixture fills a crispy phyllo cup for a delicious and easy to make appetizer. Take 1/3rd of the salmon (2 ozs) and dice. Set aside for garnish. 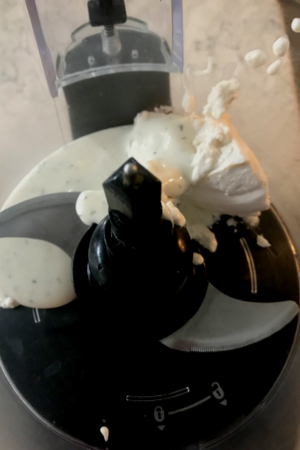 Add cream cheese and ranch dressing to a food processor and pulse until well incorporated. Add the remaining 4 ozs. of salmon and the rest of the ingredients to the food processor and pulse until you have a smooth, thick spread. Be sure to scrape the sides a few times during the process. Because of differences in brands, if your spread is too thick, add more ranch dressing. If it is too thin, add more cream cheese. Add mixture to phyllo cups so the top is slightly mounded over the top of the sides of the cup. Top with diced salmon and dill for garnish.